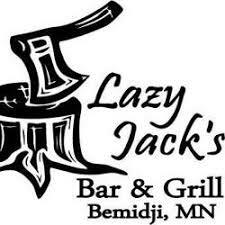 Lazy Jack's is a northwoods getaway with great food & drink, rustic cabin feel complete with a whisp of smoke from the woodstack and great folks! Generous portions mean you won't leave hungry! Try a famous wanagan sandwich, daily specials and for a special treat; a deep-fried pickle! Summer beach volleyballers and winter snowmobilers all make this lumberjack shack their go-to watering hole and so should you!